It goes without saying that Birds of Prey: Platinum Flats is not the kind of ending Birds of Prey deserved. 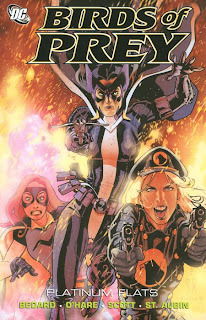 For a book that not only spawned a short-lived television series, but also had the unique providence of a second writer, Gail Simone, taking over from series creator Chuck Dixon and making the book's second half even better than its first, this melodramatic, flat end leaves much to be desired. Writer Tony Bedard tries hard, and the previous volume Club Kids had some interesting moments, but it's clear now that DC ought have ended this series when Simone went to Wonder Woman. Bedard's difficulty here, in my opinion, is trying to create drama where there's just none to be found. In Simone's last story especially we also saw Oracle leave Batman's shadow and learn to trust her operatives as friends; good for Oracle, but bad for conflict in the story. Thus we see in Platinum Flats Oracle regressing -- she's spying on former partner Black Canary, she's bringing new operatives to the team while keeping established operatives in the dark, and she's secretly teaming with backstabbing villains. It's incongruous and repetitive, and ends the story on a sour note -- for most of the book Oracle isn't someone the reader especially likes, rather than the hero we've come to respect. The second problem (and I'm surprised I can't find more about this online) is Bedard's face-off between Oracle and the Joker, who previously shot and paralyzed her. Dixon's Oracle/Joker meeting danced around the issue of how they knew each other; here, Bedard directly addresses their conflict, and the result is appropriately frightening. However, at the end of the series, even as Oracle vows to the Joker, "You took nothing from me," the Joker ultimately beats Oracle quite severely, and then escapes. If there were a clear lesson Bedard meant us to take from this as part of an ongoing arc, this might strike me differently, but on the page Oracle comes off as the loser of the episode at the tail end of the book's other troubles. I did appreciate that Bedard uses continuity to good effect. He did well tying up a loose end from his excellent Black Canary miniseries in a conversation between Oracle and Black Canary, and I very much enjoyed the use of a mystery villain here from Judd Winick's Outsiders run. I found myself wishing Bedard might've stopped there; the humdrum villains he creates to populate Platinum Flats -- and indeed the city itself, which lacks the texture of Gotham or Coast City -- are far less interesting than the villain Bedard brings back from the dead. The final two issues of Birds of Prey aren't collected here. The book ends on an uncertain note as Oracle and Black Canary, together again, set off to do battle; if that's really it, it's at least a mildly upwards note, if unfinished. My hope is that we'll see Birds of Prey #125-127 at the beginning of the Oracle: The Cure so at least we see the storyline completed, but my guess is I'll feel the same as now -- no offense to Bedard, but DC ought have quit while they were ahead. A guest review of Alice in Sunderland next, and then more Batman-related goodness with Whatever Happened to the Dark Knight?.